Here is a quick reprise for those who have plied through the search engines and found themselves squinting at a blog page in middle of this seven-part series. First off, “welcome.” Secondly, this series is my answer to a letter written by Sarah. 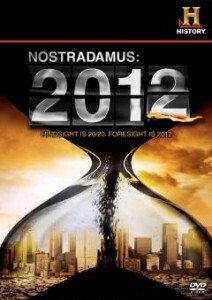 Sometime around the second weekend of March 2010, she viewed a rerun on History Channel of the hit documentary called Nostradamus 2012 — a visually stunning and somewhat sensational examination asking if Nostradamus and other prophets share an apocalyptic vision for the turning of the winter solstice in the Mayan Calendar on 21 December 2012. I appear frequently in it. Its scary message spans two-hours punctuated by an all-to-bland and brief final platitude about humanity having the power to positively change the future. The show left Sarah terrified for the future of her infant daughter and frustrated by the lack of alternatives presented. She wanted to learn more and googled “Nostradamus” and “Haiti.” That led her to a blog entitled Natural Disasters, Quickening in 2010 posted on 16 March 2010. The blog reminded readers about a number of forecasts in Predictions for 2010 stating that Mother Nature would declare war on our parasitic bad habits taking her out of natural balance starting this year. As evidence, I listed all the earthquakes and weather disasters mounting in the first 2.5 months of 2010 so far. It presented a troubling match of prophecy with reality. Sarah, already primed to be terrified by the sensational elements in Nostradamus: 2012, freaked out, taking me to task in an email. That email deserves a response because she has put into words what many of you feel needs clarification and I am happy to answer you all in this series. In all honesty, the earthquakes lately have me very freaked out. So, after seeing the show [Nostradamus: 2012], I searched for Nostradamus and Haiti and found this blog. I read through it to this page. I do. I wish it were otherwise. My technique for reading the future, which I simply call my “oracle”, is tuned into the planet and its climate. I often disagree with the message but the documented accuracy of the nature and climate prophecies in particular of the past few annual eBooks keeps getting more on target each year. Ninety percent of the climate change and natural disaster prophecies for Predictions for 2009 came true. I invite you all to read it as proof. I wish to lovingly point out; this is the point in your letter when emotions take hold of your words. The theory goes that we have centers in our subtle bodies. Some Eastern traditions give us up to seven inner centers. For simplicity’s sake today, I will only talk about the Gurdjieffian tradition. It examines only three main centers: the body-kinesthetic, the heart-emotional and the brain-mental centers. I have read Gurdjieff say that most of us at any time only use one or two centers. Two people relating do so with centers often at odds. For instance, I say something from my mind that Sarah hears from her gut or from her emotional center. The words are heard but the intent is misinterpreted because our centers rarely function as a harmonious one. Thus she and I are not in synchronicity. Gurdjieff proposed that we mostly function mechanically and that if soul can be grown and gathered in us enough to become self aware, we can then function with all three centers — body-heart-mind, in harmony. I could then speak with the wholeness of my being and Sarah could understand with the body-mind-heart wholeness of hers. I say this with friendliness to you Sarah, I do not only keep telling of terrible things coming. One blog out of thousands available does not make you an authority on what I keep or do not keep saying. However, when the emotional body is dominating, it does not care. It erupts. I am not offended because I understand. I also get unconsciously caught speaking from my emotional body. We are human. Television executives and producers are generally led by their body-kinesthetic centers. In other words, they may think and feel but they ultimately decide with their gut what will work on television and anticipate what you want to see. The gut center when out of harmony with the other centers of mind and heart tends to go with what it knows. It is all-too-human that those under the pressure of losing their jobs in high corporate offices of television networks feel it necessary to cautiously go with what has worked in the past — especially when faced with such a mounting and uncertain future. How many of you would risk your jobs and livelihoods going in a new direction every week? When times like these pressure us to make changes and take risks, the gut center resists taking a jump. Perhaps all great leaps of inner trust happen when for a brief moment our totality of centers is in harmony. The mind knows what the heart feels and the body rightly instincts that we need to take a jump, risking the new. This is what is before all of us, a need to jump into the wholeness of our selves. In Part 6 of this series I will explain why the media gut feels it must put its sensational mask on Nostradamus, 2012 and prophecy themes. This entry was posted in Media Filtering and tagged Gurdjieff, History, History Channel, http://hogueprophecy.com/wp-admin/edit.php?post_type=post&category_name=media-filtering2012, Mabus, Mayan Prophecy, natural disastars, Nostradamus, Nostradamus Obama, Nostradamus: 2012, predictions, prophecy. Bookmark the permalink. Post a comment or leave a trackback: Trackback URL.